Nier. What a game. If you haven’t had the privilege, I suggest you try it. I’d love to play along with you. This time we’ll be covering up until the conclusion of the second playthrough, ending “B.” If you’ve missed my previous entries, or just want to catch up, you can click through for part 1, part 2, part 3, and part 4. As I mentioned last time, with the second playthrough comes a new game mechanic: hacking. Your player character this go around, 9s, is an android like 2b, but he differs in that he’s a scanner. Scanners have the ability to hack into other machines. Its a very cool way of interacting with your enemies. Its like a game of asteroids. You’re on a field and you control like a twin stick shooter. There are black objects shooting at you. Destroy the black objects, dodge the bullets. If all black objects are destroyed, you’ve got a successful hack. If not, jump back in. I think about FF7 a ton when I play Nier. When I think of the gameplay of FF7, the biggest joys I recall are all the minigames. There were motorcycle races, snowboarding, chocobo racing... even squats! It really helped those hours slip past from all the variety. Nier has variety too. Its a blistering action game, a scrolling shooter, a twin stick shooter, and a 2D platformer. It changes on you in the blink of an eye, and it elaborates on itself so frequently, that its hard to grow tired. It has a confidence in its presentation that gives it a a real attractive quality. 9s examines the world on a wholly different plane than 2b. Hacking into enemies, exploring what makes them tick, and taking advantage of these weaknesses is exhilarating. Where as 2b destroys with tactical precision, 9s has to dig through his enemies to get a handle on them. Not only this, but like Simone (whom I discussed in length in part 4), you have the opportunity of gaining perspective on your enemies. Your enemies want nothing less than to kill you, but through 9s, we learn of their history and their reason for attack. Playing through the Forest Zone really drove this home for me. As 2b, I ran through this zone, feeling curiosity toward my attackers. I knew they fought for a king, but upon seeing their king (not what you expect to be sure), I felt pity on them. Misguided machines, placing loyalty upon an object that didn’t deserve it. As 9s, I learn about their kings origin. The first machine to disconnect from the network, and seek his own path. He welcomed his brethren, drawing more and more citizens into his kingdom, machines that were finished with war. He gave of himself to bring in his subjects, until exhausting himself. His people took his memory chip and placed it in a child machine, vowing to raise the child to be their new king. Their new king did not grow however. All the memory, all the possibilities of this child, left unfulfilled. They vowed to protect the child, holding onto hope that a new path for their king would someday come. That day never came. Instead, my own actions as 9s and 2b, led to the destruction of the Forest Kingdom’s hopes and dreams for the future. These machines had built a civilization and existed for an ideal. I ventured into their dream, destroying what they held dear. Only after I did this, was a given perspective. This game gave me regret. What a move. As 2b, destruction of my enemies drove me. As 9s, understanding of my enemies drives me. I am left curious as to what else Nier holds for me. 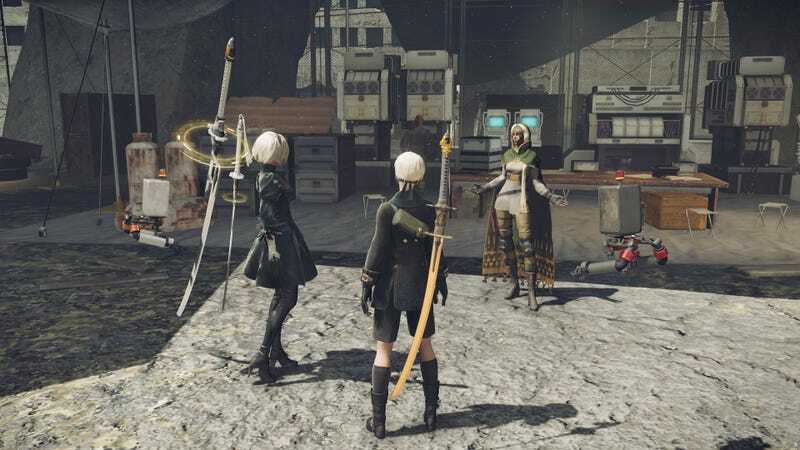 There is a point in the story of Nier when 9s is separated from 2b. It is during this time that the small hacking game, a simple twin stick shooter, becomes an interface for navigating the systems and inner memory of the player characters as well as the memory of the Bunker, a sort of mission command for your unit. I am curious at the slower pace of these portions. Instead of an action shooter, they become an almost exploratory exercise. You spend your time navigating a small maze, turning on systems that are turned off, and learning bits of the back story. 9s becomes privy to a piece of information that no one else knows, something that could change the fabric of understanding for all androids fighting for the glory of mankind. The interesting thing about playing through a game with so many shifting perspectives is that the player needs to put themselves in the position of their player character at any given moment. Playing games always seems to have the most impact on my thought processes the more I relate with who I am playing as in the moment. This immersion is at the center of innovation for videogames. Because the perspective shifts so much in Nier, both on a gameplay as well as story level, we are required to shift our perspective along with it. Its simple to view the story as a connected whole, but trying to fragment it, much like the characters each perceive on an individual level, allows a more intimate connection with the player character. There’s a pivotal moment that occurs shortly into the 3rd playthrough that is given shades of meaning the closer we get to experiencing the moment as our player character experiences it. I’ll save this revelation, as I think it will make an interesting central focus for Part 6 of this series. The more time I spend away from the world of Nier, the more I want to uncover its secrets. Its been quite the week, full of busyness as 2017 closes out. These past couple weeks hasn’t left much space for gaming. As I have spent less time gaming, and more time at work, with family, and with friends, what surprises me most is not that I miss the rush of combat, the thrill of hacking. What I am surprised by, and miss, is learning about these characters, their motivations and their fears.